If you are traveling in Southeast Asia, you will end up in Thailand at some point. I was not planning to go there at all. I actually wanted to skip Thailand entirely. Why? Because in my mind I had the picture of a place that is fully packed with tourists. Not any tourists, but Germans. After Mallorca, Thailand is the second most popular holiday destination for my folks. The thing you have to know about traveling Germans is that they usually try to avoid each other. Nobody knows the underlying reason, but Germans do not really like to meet each other while they are traveling. The same occurs for me. Of course, it depends where you are. If you have not talked in your mother tongue in weeks, then it might be nice to meet someone from your home country to talk in your language again for a little while. But that is about it. Usually, it is already enough for one day. If I did not want to meet Germans every day, I should rather stay away from Thailand. That is what I was thinking. Unfortunately, you cannot really avoid Thailand. At the end, all roads are leading there at some point. If you are looking for cheap flights to anywhere in Southeast Asia, even back to Europe, Bangkok is the place to go. Especially, when you are planning to visit Laos, Cambodia, Vietnam and Myanmar, Thailand is located in the center of all those countries. At some point, you must travel through the country. So that is the reason why I ended up in Thailand. After all, it is definitely a great destination if you are into scuba diving and snorkeling. Like I am. 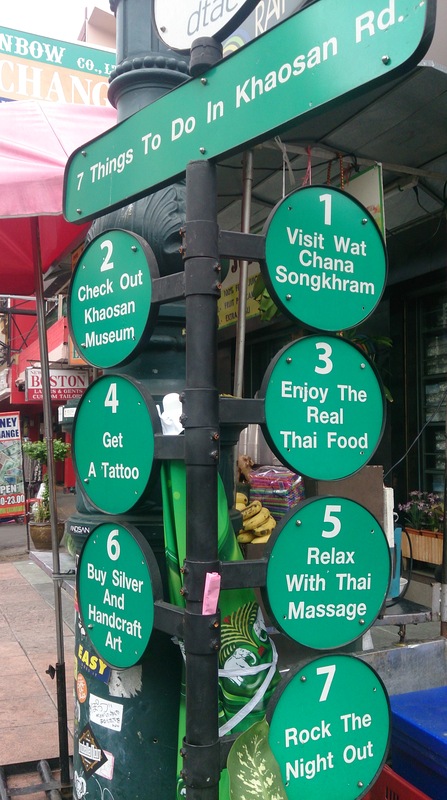 I gave Thailand a try… In the following, I will sum up my experience and my impressions. After I finished working for three weeks in Melaka, Malaysia, where I barely did anything else but working and eating, I decided to treat myself on Christmas. Scuba diving in the world famous Similan Islands. Expensive, but totally worth it! With Khao Lak Explorers, I went to the North Point and Breakfast Bend. Two breathtaking, incredible dives! Visibility of 20m, crystal clear water, turtles, sharks, so much colorful marine live to explore. It was a delight! Plus, finally I got some very good pictures of me diving. That was the best Christmas present ever! After my month in the Philippines, I thought I was used to bad transportation. Until I got to Thailand. That was a whole different dimension. The distance from Khao Lak to Koh Lanta is not far at all. If you are going straight, you can make it in not even three hours. Well, if they would come on time and skip all unnecessary stops in-between. First, I had to wait two and a half hours until they picked me up at my hotel, then they brought us to their ‘bus stop’ in Krabi, which was a restaurant where you had for another two hours. Thai business. They just bring you there without telling you in advance, they let you wait, so you have to order food. At the end, they make not only money with the transportation, but also with food and drinks. I have to admit that is quie a smart business. After 10 horribly long hours I finally arrived in Koh Lanta. I was supposed to arrive there in the early afternoon; instead I ended up there late in the evening. A whole day was wasted because of the bad infrastructure. Koh Lanta is the neighbor island of Koh Phi Phi, which is famous for the setting of the movie ‘The Beach’. It is supposed to be very beautiful, but also packed with tourists. Not any tourists, but the crazy party ones. Exactly the reason why I did not go there. I prefer more quiet places like Koh Lanta. One of the main reasons why Thailand is more than ever a very popular spot for travelers and backpackers is its world famous party, the so-called Full Moon Party. Unfortunately, full moon occurs only once a month. Since Thai people are business people, they know how to make more money out of this ‘unique’ party concept. How? Well, there is a Half Moon Party, a Dark Moon Party, a Jungle Party, a Goa Party and so on. Let’s just sum it up in ‘Everyday Party’. Ever since I am on my party break, I was not really interested in exploring Thailand’s party life. At some point, I ended up in some pretty locations in Koh Lanta anyway. There are for example the Mushroom and the Freedom Bar. Only two out of many more cool places. Both of which are located right on the beach and entirely decorated with black lights and fluorescent colors. It could not be any more cliché: Being on the beach, laying on the ground on comfortable and colorful blankets and cushions, in front of you the moving sea, jugglers playing with fire, in the background relaxing music, on the menu a variety of cheap cocktails, joints and happy shakes. What else could you possibly ask for? And there it was. After a couple of great first days in Thailand, all the sudden I ended up in the hell of tourism. I found the place I always imagined of Thailand. Koh Samui. No more cheap Tuktuks waiting at the ferry station to pick you up for a decent price. No, no. Instead, nothing but expensive only taxis waiting for you. Of course only with fixed prices. No more bargaining. From now on, Thailand would not be a cheap holiday destination anymore. I did not want to go to Koh Samui at all, but I was meeting there with a friend from Germany to celebrate New Year’s Eve together. She was traveling there with her boyfriend. If she was not there, I would have totally skipped Koh Samui, well, actually Thailand in general. However. I wanted to see her again, so I went to Thailand anyway. Unfortunately, New Year’s Eve was not the best time to travel in Thailand at all. It was the peak of the peak of the season. Every single hostel was sold out. There were people everywhere. The island was packed! After four days in Koh Samui it was really time to leave the island again. I only stayed that long to spend some time with my friend from Germany. Otherwise, I would have skipped the island entirely what I highly recommend every Thailand traveler who is not looking for a party holiday, bur for an authentic experience instead. I love riding a scooter!!! I was really looking forward finally to arrive in Koh Tao, the Turtle Island. More than 20 dive sites waiting for me to be explored. One week of diving, diving, nothing but diving! More than 60 dive centers on the small island close to Koh Panghan guarantee dives for reasonable prices. Koh Tao is the cheapest place to get your dive certification in whole Thailand. Quiet waters and a good visibility make it a popular spot for not only beginners, but also for advanced divers. The underwater world is full of surprises! On one dive, for example, we saw a blacktip reef shark, which happens very rarely. We were very lucky 🙂 Finally, I was spending a pretty good time with the diver community again. I can highly recommend the ‘Big Blue Diving’ center if you appreciate good organization, time management and safety standards. But if you are about to make your PADI Open Water, I would rather prefer a smaller dive center, because this one is very, very, very busy. It can easily happen that you are in a group of 6 beginners. In my opinion, definitely too much. After all, the Philippines are still my number one country in Southeast Asia. It is so much easier to get in touch with locals and hang out with them. They are still treating you friendly and helping you if you are lost or looking for something. Of course, it is also about money, but not as bad as in Thailand. There you are nothing, but a tourist and people make money with you. That is what it is all about and that is exactly how they will treat you. Tourist equals costumer equals money. It would barely happen to you to be invited to a family’s home or for dinner or anything… The Philippines on the other hand are less touristy and still more authentic. I hope this will last for a little while… Tourism might bring out the best of a country, but certainly not in people.